New Beijing is a melting pot of humans and androids, science and the living. Stuck smack dab in the middle is Cinder, a cyborg mechanic with big dreams. The novel starts out much like Cinderella. Cinder is under appreciated and overworked by her wicked stepmother. Gifted with mechanical abilities, Cinder uses her knowledge to provide for her adoptive family. But things change when the prince comes to Cinder’s stall and asks for her help fixing a royal android. Little does Cinder know that this android holds the key to her past and will open up endless possibilities and endless strife. 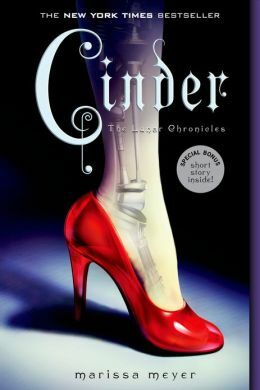 While reading Cinder, I loved tracing the story of Cinderella and seeing the differences. Creating a cyborg Cinderella is a bold move but an amazing one. I really enjoyed that Cinder was a strong female character. She didn’t sit by passively while life happens to her or wait for a fairy godmother. She goes out and gets what she wants. She strives to be in control of her own destiny one way or another. I also enjoyed the relationship progression between Kai and Cinder. It never felt particularly forced and moved on at a more natural pace. Both actually acted more like the teenagers they both are. They’re confused and not sure how to proceed. They don’t know what will happen in the future and desperately want to find out. But all is not a fairy tale in New Beijing. A deadly plague has been sweeping through the Earthen colonies clamming many lives. In addition to the plague, Earth’s relationship with Luna, a moon colony gone rogue, is at best tense. Luna claims to have found a cure for the plague, but everything comes with a price. The Lunar queen, Leavana, is known for her cruelty as well as for her “beauty.” She has grand plans of conquering and ruling the world with an iron fist and wants nothing to stand in her way. The only thing slightly negative I can say at all about Cinder is that it was a bit formulaic. I saw the ending and the big reveal in the beginning of the novel. Though I do have to say it did not hamper my enjoyment of the novel. Meyer did a fabulous job creating lively and complex characters. I can’t wait to see what the next novel has in store for them. Next up in Book Battle 2015 is a book with a one word title. I oscillated back and forth on this category for about a month. I’m so indecisive when it comes to what I want to read next because I just want to read everything. Then I get myself in over my head by being way too overzealous. I finally narrowed down my list of one word titles and settled on Marissa Meyer’s Cinder. I’ve heard some great things about this novel, as well as the series as a whole, and I can’t wait to get started. Usually I’m not too big on sci-fi but am fully willing to give this novel a go. I love the fairy tale premise and can’t wait to see how Meyer manipulates the genre. Combing sci-fi, fantasy, and fairy tale should be an interesting read. I’m curious to see how all of these elements will change/enhance the original tale. Stay tuned for the full review of Cinder. Happy reading!